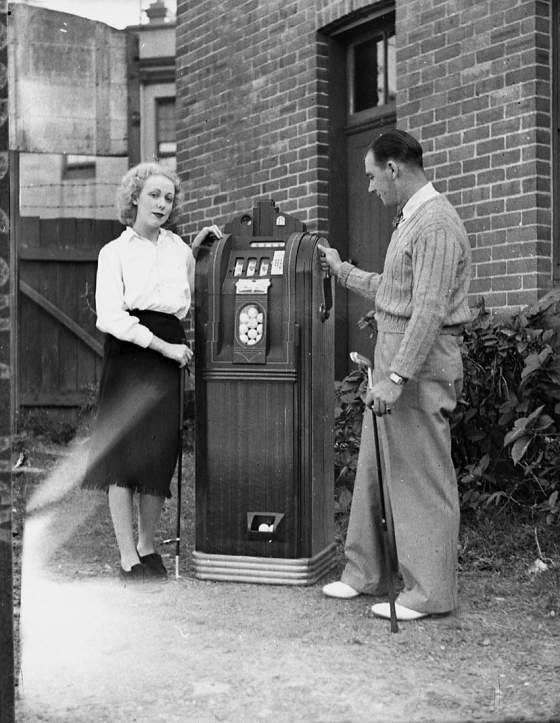 Produced during the 1930s and 1940s, the Mills Golf Ball Slot Machine was one of a number of novelty coin-op machines produced by Mills Industries. Among those was the Mills Violano-Virtuoso, a coin-operated violin player. The Chicago-based company also produced many regular slot machines, jukeboxes and coin vending machines. An article from the Melbourne Argus actually describes a theft involving a golf ball slot machine. Mills Industries was founded in 1891 to produce cigar vending machines based on patents held by Mortimer Mills. Originally called the M.B.M. Cigar Vending Company, it created the first upright cabinet slot machine in 1897. A year later it was sold to Mortimer Mills’ son Herbert and renamed the Mills Novelty Company. The company would go on to produce a wide variety of coin-operated products, including radios, phonographs and gum machines. Coca-Cola contracted Mills to design and produce the first refrigerated bottle vending machines. The passage of federal law in 1951 banning the transportation of slot machines between states doomed the company. The main products became vending machines, and commercial food equipment. Mills Industries was acquired by F.L. Jacobs, a Detroit auto supplier in 1954, who consolidated operations in Traverse City, Michigan. The distribution arm of Mills Industries, Mills Bell-O-Matic survived in a fashion through several mergers and name changes until the 1980s. Click on the photo to embiggen.